A van caught fire and then exploded on Route 149 in Deering, NH, which closed the highway for nearly two hours Saturday afternoon as crews put out the blaze. 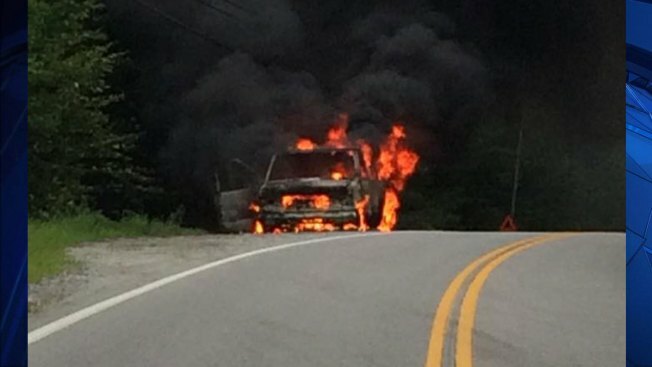 The incident occurred near His Mansion Road at about 3 p.m. Police said a 1994 Ford Clubwagon van was fully engulfed in flames but fortunately the driver and his passenger escaped the burning vehicle. As emergency workers moved the occupants away from the fire, the vehicle exploded. "The vehicle occupants and other motorists who had been stopped were rapidly pushed back away from the scene, just in time as tires, batteries, and fuel tanks began rupturing and exploding," according to a Deering Police news release. Police said the roadway was reopened around 5 p.m. No injuries were reported.